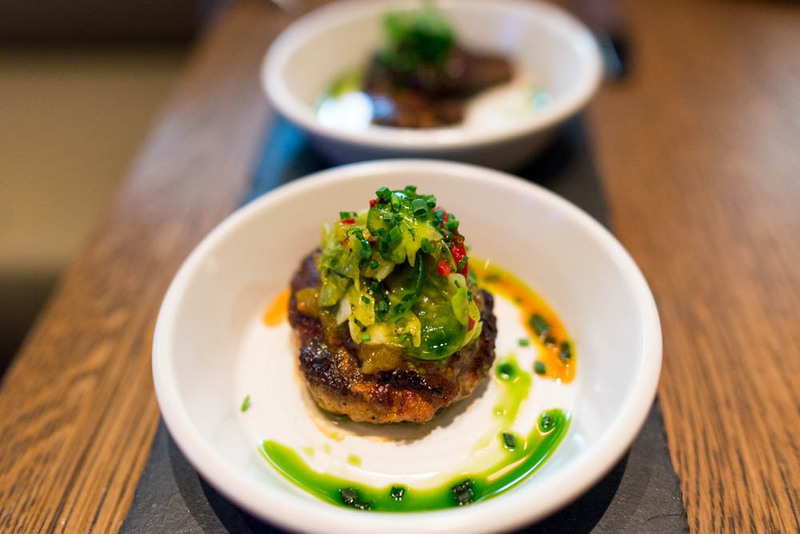 Bobby Flay’s newest project Gato perches just above Houston on Lafayette and is the first new restaurant that he has opened in New York in nine whole years. After such a long time away, you have to come back with something that will really wow the city. And instead of something similar to Bar Americain or the now closed Mesa Grill, Bobby decided to take the direction by way of the Mediterranean and Spain and threw open the doors to Gato about 2 months ago. HH and I decided to check out the spot after work on Thursday in the beginning of April. Even though I am not sure how I feel about Bobby Flay, the enticing menu was enough to get me on board to give Gato a try. The second we stepped inside, we were already pretty impressed. The sprawling restaurant has soaring ceilings and a beautiful bar lounge space in the front of the house that was welcoming and bustling. 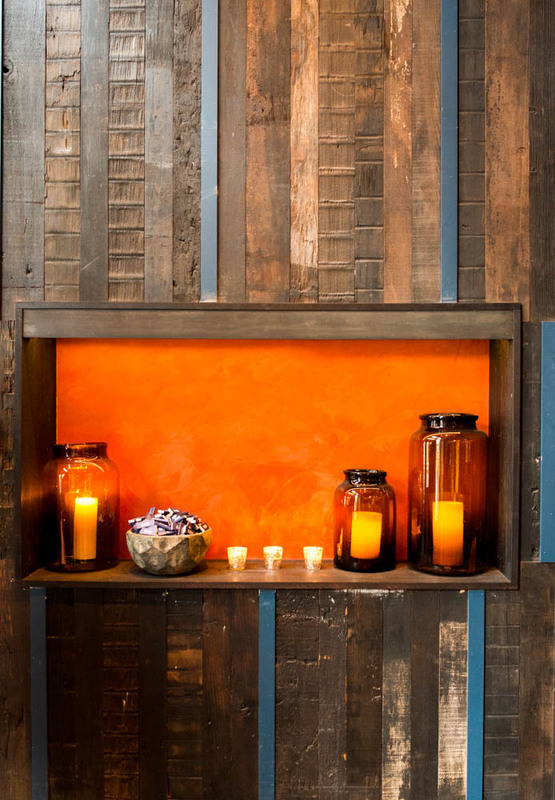 I loved the wood panels and mosaic tiled floors and the warm glow that fell on the restaurant as the sun started to set. Through paneled windows, I even caught glimpses of Bobby in the kitchen as he worked throughout the night going from station to station. We were in a nibbling mood that night so we spent extra time perusing the bar bites and the appetizer sections. The bar bites were two bite pieces and three made for the perfect starter, a little amuse bouche if you will for two people. We agreed quickly on the artichoke heart with uni, chorizo crepinette, and the duck liver with red grapes. 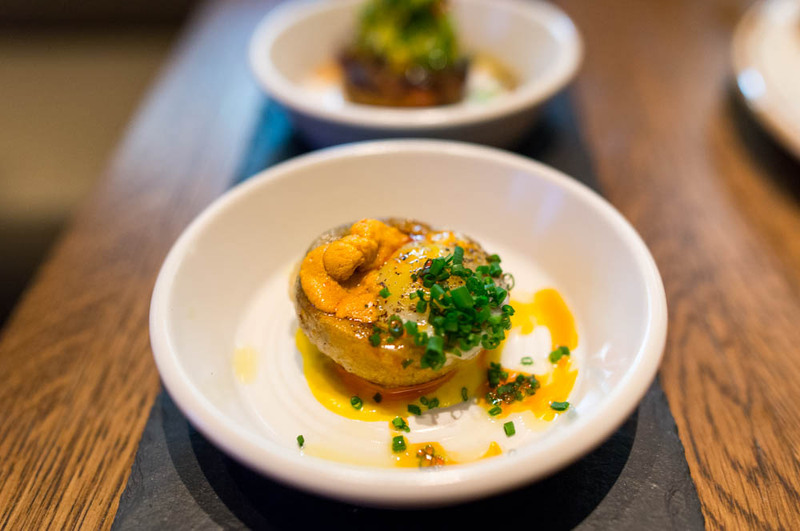 The subtle flavors of the artichoke heart with uni was a great contrast to the punch of flavor that the chorizo crepinette. 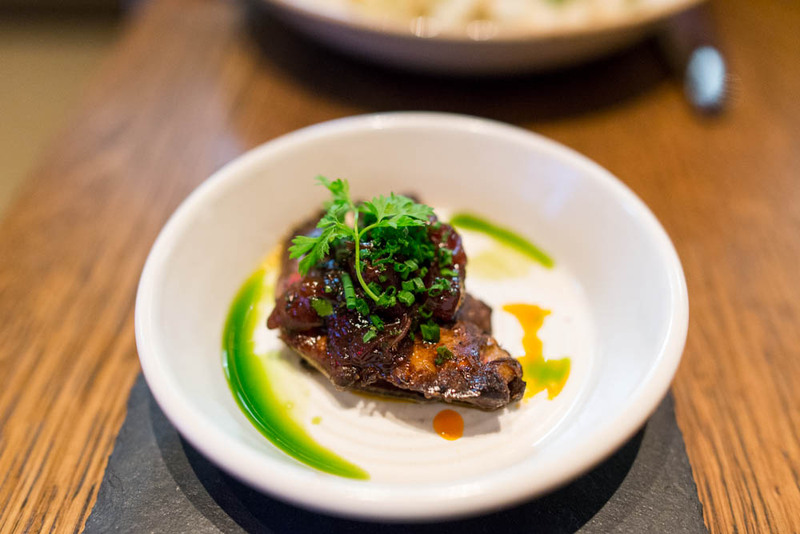 The duck liver was served in its natural form, not in the typical expected mousse, was bold and definitely not for those who don’t love the gamey flavor. 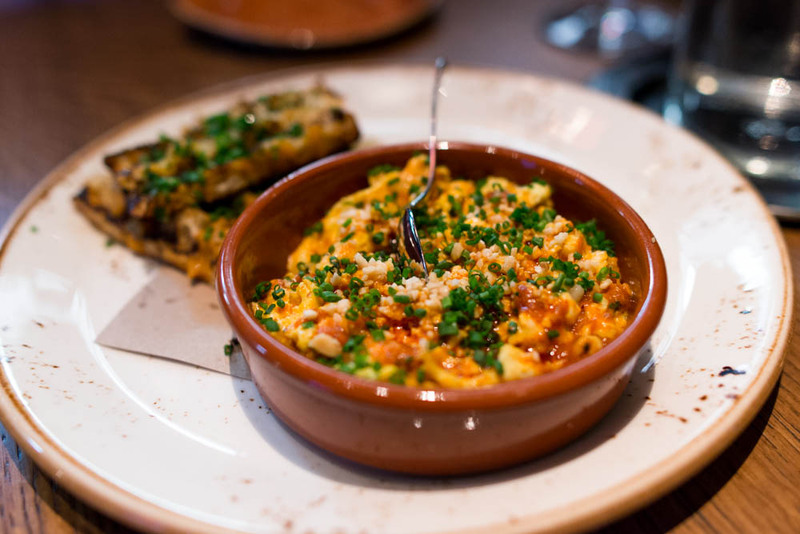 Of the appetizers, the scrambled eggs with almond romesco and boucheron cheese and the crispy squid jumped out at us immediately. Served with tomato confit toast, the creamy rich eggs were a hit with both of us. The crispy squid was a generous portion. 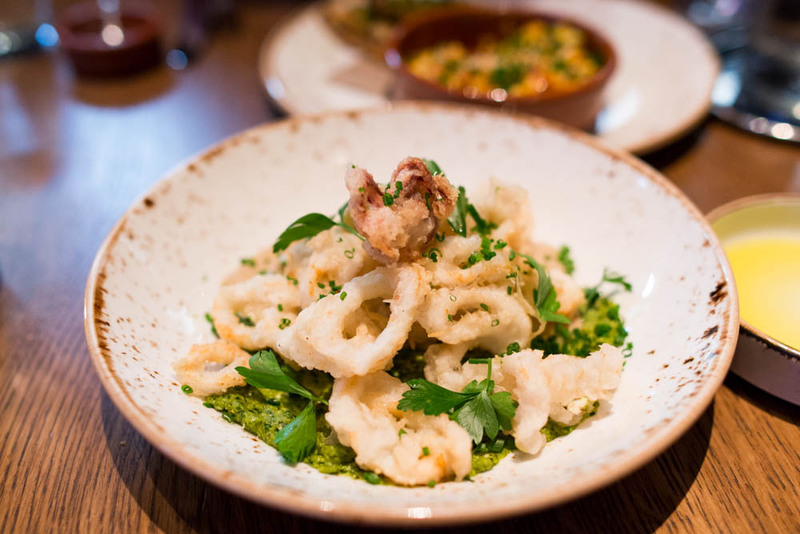 While there is not much you can improve up fried squid, the anchovy vinaigrette and the green chile pesto at the bottom of the plate were pretty darn tasty and imparted a punchy Mediterranean flavor. 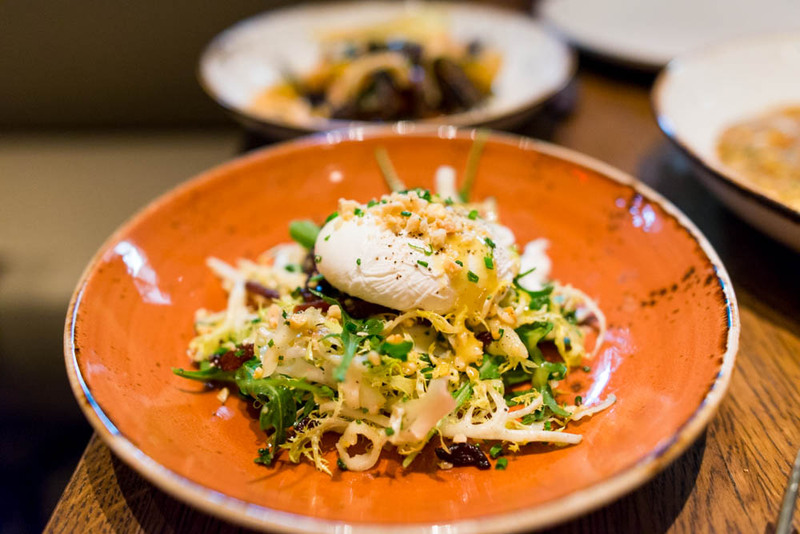 To balance out the richness of the eggs and squid, we balanced it out with the white chicory salad. The sturdy slightly bitter lettuce was dressed with chorizo, Fontina and an almond-cranberry vinaigrette and a beautifully poached egg to top it all off. For our main, we debated back and forth between the crab risotto and the squid ink fettuccine with prawns. 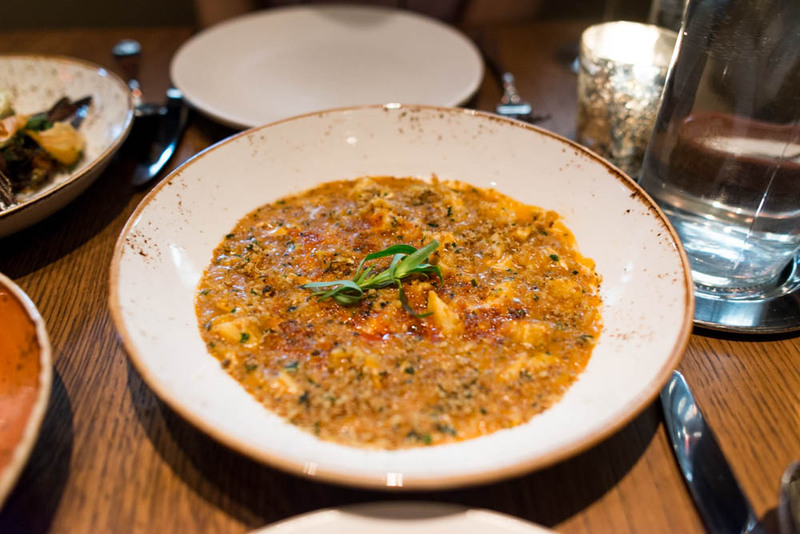 In the end, the crab risotto with calabrian chile won out. The dish came studded with an abundance of fresh crab meat and unfortunately, my first bite had me searching for my water glass, as if I had just taken a bite of the sea itself. HH had the same reaction and our concern was addressed immediately by a member of the management who quickly rectified the problem. Evidently, adding additional salt to already well seasoned crab meat was the culprit. 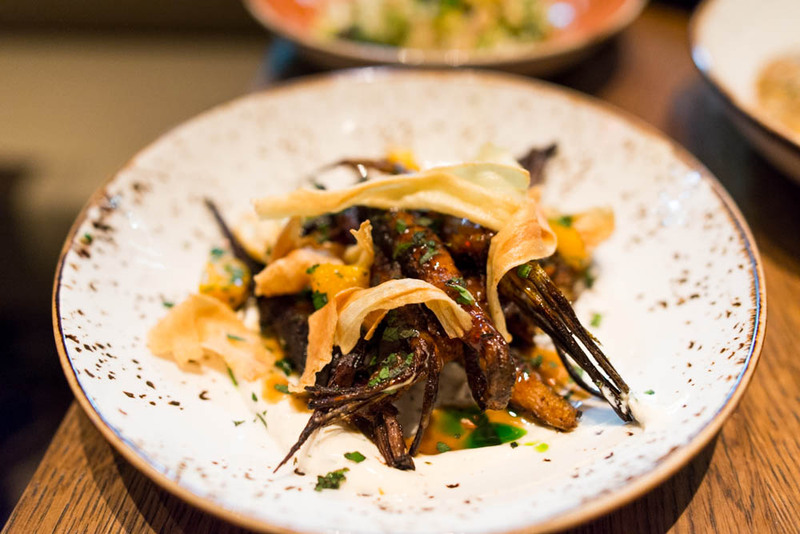 While we waited, we savored the roasted carrots with parsnip chips, harissa, mint and yogurt. The sweetness and warmth of carrots and harissa was balanced by the cool smooth yogurt and mint. A beautifully done side dish that made for a great side. By the time we wrapped up our dinner, the restaurant had filled up quite nicely, bringing a nice ding to the space. Clearly, everyone was eager to try out Bobby Flay’s newest hot spot. 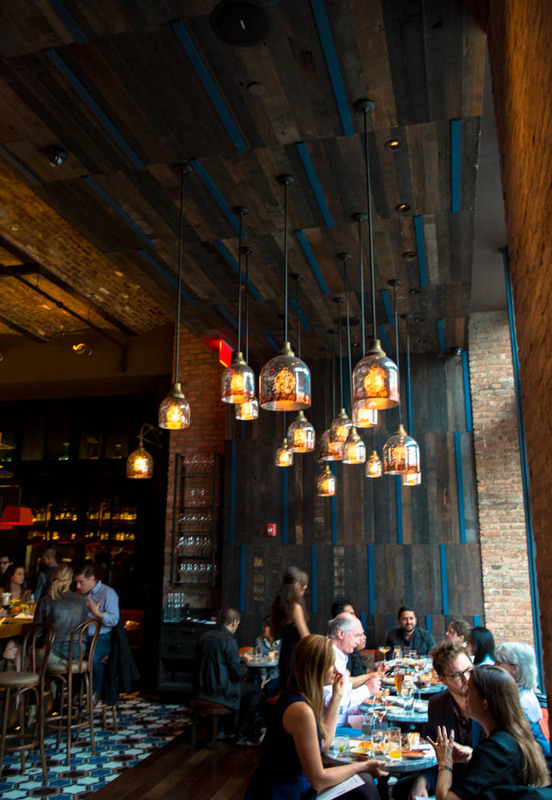 I loved the warmth and vibrancy of Gato with a creative menu that has added exciting flavors to Noho. With such shareable bites and dishes, this will definitely be a great spot to grab a drink and some delicious food along with it. I have to admit I dismissed Gato as soon as I head “Bobby Flay” but your post piqued my curiosity, will definitely give it a shot. Thanks!